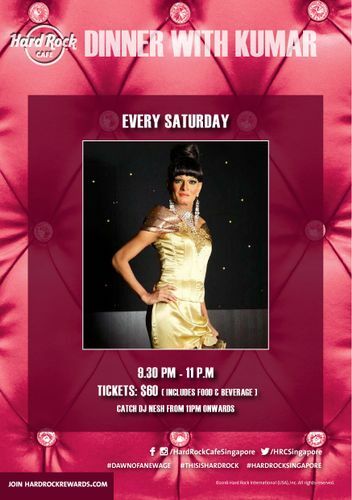 Singapore’s favourite Drag Queen of Comedy, Kumar, returns to Hard Rock Cafe Singapore for more rib-tickling and risqué jokes! Bringing to you a fresh concept - Dinner with Kumar promises barrels of laughter while you feast on your favourite Hard Rock Cafe food and drinks from the A La Carte menu for S$60.00 per person. Share a night of laughter, food and top-class entertainment every Saturday night, 9.30pm at the brand new Hard Rock Cafe Singapore, with your family and friends.